Create Embellish Adore: Two cards....EGG- cellent! Its been such a nice weather week, I have been busy on the outside, and dearly slacking on the inside. Its that time of year, so I get a "pass". I did sneak in a few Easter cards - simple - so I could get them in the mail in the next week. They are the same card, but one is simple and the other is stepped up a notch. I went alittle crazy with glitter! I used the Tastful Trims (Big Shot die) for the grass (Celery) & Ricrac (Melon);Butterfly embosslit (Big Shot) in Melon & Peach Parfait and embossed the Natural White , I hand cut my ovals; you can Google templates, from Wisteria a dear friend sent me some new rubbah, in which I used the Easter Blessing sentiment. 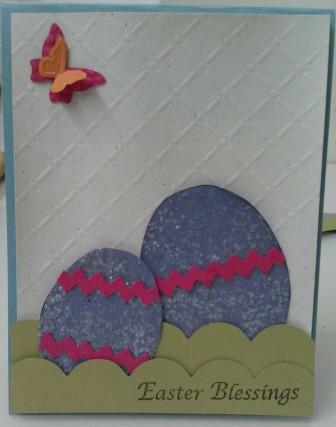 Now its your turn to show off your Easter cards, head on over to the Bloggers Challenge. These are both great cards. So cute and simple but effective. very cute cards Chera, love the glittered eggs. Wonderful cards. The eggs are great. Very cute card, love your Easter Eggs. 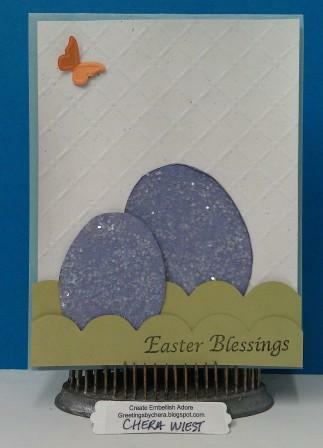 Love your fun card design-love the grid design and the glitter eggs- awesome! So sweet! Love the glittered eggs. I bet you are still finding glitter all over! Such a fun Easter card! The glitter really makes it. Love the glittery eggs! Thanks for playing along with the Bloggers Challenge!